snowdeal.org > ex machina: the eric update - day 297: the toothbrush teether ( not by ronco ). 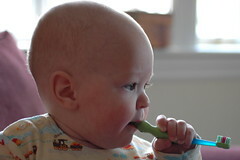 the eric update - day 297: the toothbrush teether ( not by ronco ). inspired perhaps a bit by the sensorial explorer concept that advocates giving infants "real" objects to play with and realizing that it's never too early to start teaching the benefits of good oral hygiene, we decided to give odin a toothbrush to play with. it's become one of his favorite toys. it's the perfect size for his little hands and while the bristled end is nice to tickle the gums, the soft rubber end is even better for soothing teething soreness. and as a sneeky side benefit, he gets familiarized with something that he'll hopefully learn to use properly when the proper time comes. we did the same thing for my brother we also gave him a sippy cup with handles to play with at dinner it really helped to teach him how to hold the toothbrush.